A person claiming to be a former data center tech at Amazon implicates the company in working directly with the NSA and CIA to domestically spy on Americans. 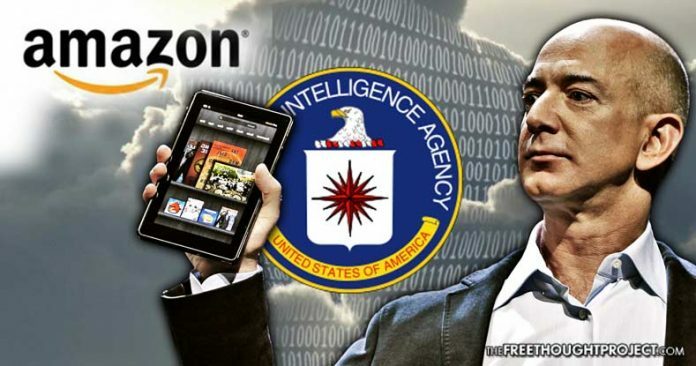 Washington, D.C. – Amazon, and its owner Jeff Bezos, who recently surpassed Bill Gates to become the richest man in the world – and who has a $600 million dollar contract with the CIA – have come under fire after a purported whistleblower implicated the company of collusion with the CIA and NSA to spy on Americans. Bezos, who also owns one of the main propaganda outlets in the United States, The Washington Post, is a controversial figure, who has deep ties to the national security apparatus. He is a former Bilderburger, who has enmeshed his corporations with the national security state. After building Amazon into an e-commerce behemoth, CEO Jeff Bezos purchased the ailing 140-year-old media goliath in 2013 for $250 million — but his lack of experience in media raised the eyebrows of that industry and much of the business world. The same year Bezos purchased the Post, Amazon landed a $600 million deal with the CIA to develop a coordinated computing cloud for all 17 agencies of the U.S. intelligence community. Although innocuous on the surface, that sizable deal appears somewhat darker in consideration of this year’s quasi-official continuance of the U.S. government’s most notorious propaganda program, Operation Mockingbird — during which intelligence agents posed as the media to imbue pro-American propaganda and censor certain information. Now, a person claiming to be a former tech at one of Amazon’s data centers, which operates “under the purview of VADATA, Inc.” — in an effort to conceal its relationship to Amazon – made a detailed, and scathing claim, which directly implicates the company in working directly with the NSA and CIA to domestically spy on Americans hosting their data on AWS servers. The whistleblower claims that after having stumbled upon the illegal domestic surveillance, and notifying superiors to no avail, he/she began to be targeted by both electronic and physical surveillance. In 2011-2012 I worked for AWS on the PDX OPS team. We were responsible for the installation and upkeep of a newly created data cluster in Boardman, OR and Umatilla, OR known internally as PDX. These datacenters are different from others in that they only hire natural born citizens mainly because hidden away in these datacenters is a section known as PDT. Amazon has these datacenters under the purview of VADATA, Inc so the public doesn’t directly know its an Amazon datacenter. The PDT section is where the government hosts are located. Within this area you’re not allowed to bring in ANY outside electronic device. Doing so accidentally can bring about a felony charge that carries a 10 year sentence, purposefully doing so can be upwards of 50. The security of these datacenters was so tight they even hired an ex-CIA officer to run security. One afternoon, while reading articles about Snowden leaks, I get a ticket of a PDT host being utulizied by the CIA that had a failed Network Interface Card (NIC). I replaced the card, loaded the firmware and got the host to assimilate to the rest of the network. To verify I fixed the issue I used a RedHat Linux command to show what other hosts the host I was working on was connected to. I had to use a special command known as “sudo” to give me temporary admin privileges to run the command. What I got back from that command was seeing this host was connected to PRIVATE hosts. When I was first hired I was explicitly told that I should report any instance of a PDT host connecting to a PDX host as it was unconstitutional. I suspected maybe other hosts were like this and found other CIA and NSA hosts doing the same thing. I immediately reported it to the datacenter manager and he told me not to worry. After that I noticed a lot of weird things outside of work. My phone would make odd noises when I was calling someone. Numerous occasions I had planes follow me. One time I took a walk around town and this helicopter was following me almost the entirety of my walk. I tried to be out as long as I could and the helicopter left to refeul and came back to find me. I also had someone logging into my bank account on a recurring basis. I would get a text notification everyday at 6am that someone logged into my account. I spoke with the bank IT staff and got them traceroute the request and it was coming from Langley, VA. After this the logins into my account immediately stopped. Nevertheless my contract wasn’t renewed and my career in IT has stalled since then. My suspicion is I was placed on a blacklist. I am also an unusual IT technician in that I have experience in working in DC having a lot of facetime with politicians and other powerplayers. I was in a unique position to understand the technology AND the significant political impact that this could have on the rest of America. The Free Thought Project attempted to contact the whistleblower to corroborate their version of events, but at the time of publication had not received a response. The clear collusion between Amazon and Post owner Jeff Bezos, and the national security apparatus, is clear and unambiguous. The whistleblower’s revelations provide a unique insight into exactly how Bezos is using his mega-fortune to assist in propping up a duel purpose propaganda/domestic surveillance apparatus that allows the government to essentially use these companies as private contractors for the security state, while outwardly operating as businesses that serve the public interest, thus lulling the average American into complacency. Please share this story to help awaken the public to the collusion between government and business at the expense of privacy and truth!